Readers who have been a part of Traverse, Northern Michigan’s Magazine, know that we have produced a guide to giving in Northern Michigan for many years. What you might notice is that we have changed the name to GIVE Northern Michigan. While the name has changed, the mission has not. It’s simple: We want to connect you to the incredible work being done by nonprofits in Northern Michigan in the hope that you find ways to donate and/or volunteer. Click the cover to read GIVE online, free. GIVE Northern Michigan exists because of a few simple truths: People generally want to donate and volunteer. It can be hard to navigate a way forward given the enormity of need and efforts. Local nonprofits don’t always have the budget to grab your attention. Northern Michigan is filled with vibrant, active people who often find each other through the local causes they support. Our region is not alone. Some years ago, I read an article about a study by the Chronicle of Philanthropy that took a look at charitable giving by ZIP code throughout the country. The most dramatic finding in the study appears to be that people with lower incomes tend to give a significantly higher percentage of their household income to charity, versus those with higher incomes. The study found that households with incomes of $50,000 to $75,000 donate on average 7.6 percent of their discretionary income. While households with incomes of $200,000 or more donate about 4 percent. Some of this was attributed to giving to religious institutions. But there was another factor indicated in the study: People with lower incomes are often confronted with the needs of their community on a daily basis. People in upper income brackets tend to be more isolated from the vast diversity of needs even right in their own regions. In the article, the question is posed, “What does this isolation mean for charities?” Kristin Valentine, development director for Bread for the City, in Washington, D.C., feels like people in our upper income neighborhoods are often willing to donate at higher levels, but nonprofits need to do a better job of telling their stories in ways that make it easy for donors to connect. Valentine feels that if nonprofits also educate people as to volunteer opportunities, more people will show up and see firsthand the difference their dollars and their efforts can make. I can’t think of a better explanation as to why we produce GIVE Northern Michigan. We understand that a lot of people don’t even know about the diversity found in Northern Michigan’s nonprofit community or don’t pick our nonprofits out of the large amount of direct mail found in their mailboxes, particularly at the end of the year. Studies show how hard it is for busy people to sort through all the requests, trying to ferret out the nonprofits they would like to support. In addition, Northern Michigan nonprofits are usually competing with extremely well funded and vital national and international campaigns, making it difficult for a single nonprofit in our region to get noticed and be able to tell their story effectively to the people who might really be able to make a difference. And time and time again, whether it is through hearing from readers or being a part of local efforts, I hear about people who made Northern Michigan their home base and then found likeminded friends and a sense of community when they became involved in a local nonprofit effort. 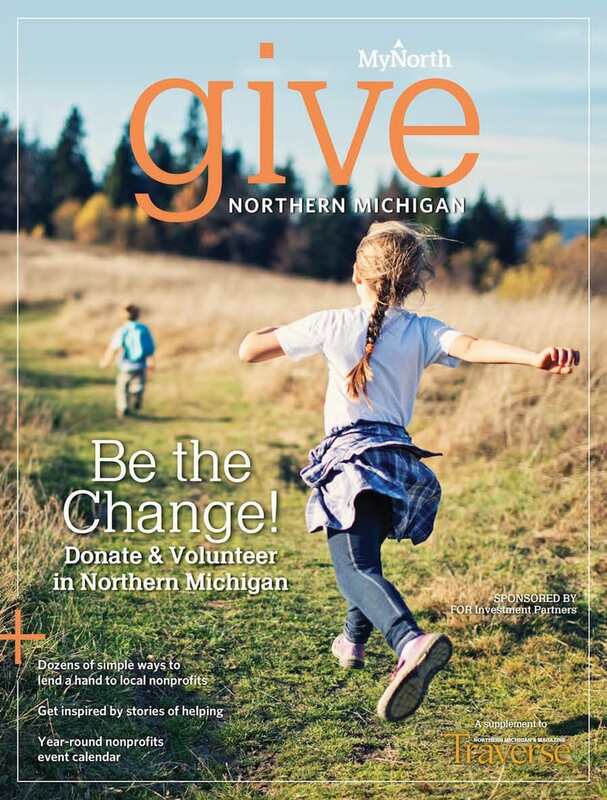 Our goal with GIVE Northern Michigan is to help our nonprofits to stand out in the crowd and to create an enjoyable, relaxing, engaging environment for donors to truly connect. We hope GIVE prompts you to donate or volunteer directly from the information found on these pages. And we hope you hang onto GIVE. It will still be a resource and a source of inspiration months from now. Thank you for allowing us to bring the efforts being made for the citizens and landscapes of our region into your homes and into your lives. I know you will be inspired. And I promise you will make a difference when you include Northern Michigan nonprofits in your donations of both money and time this year. On behalf of all the great efforts being made by so many, for so much good in Northern Michigan, thank you.